About the mint chips- I love the Guittard brand. I first tried them in Utah- super cheap at Ream's (like everything else there). Now I find the mint chips, in the pretty green bag, at my Safeway, most of the time, particularly around the holidays. You can also order them. It's totally worth it, these things are so delicious and versatile. You could also chop up York peppermint patties or Junior Mints. Same idea but more mess (though still, crazy delicious!) I'm told some people don't like mint and chocolate, in which case I'd recommend peanut butter chips. Mint holds my heart though. Preheat oven to 350 degrees and prepare baking sheets (Grease or line with Silpat or parchment paper). Cream together the butter, brown sugar and white sugar until light and fluffy (about 2 minutes in the KitchenAid). Add eggs one at a time, beating well with each addiction. Add vanilla and mix once to combine. With the mixer on low, slowly add in the dry mixture, stirring until just incorporated. Fold in white chocolate chips. Scoop onto the prepared cookie sheet and squish slightly if flatter cookies are desired. I needed these today! I have loved every one of your recipes that I have tried. How did you manage to abstain from the chocolate cake...?! Good work! I don't like mint in Savoury foods but in Sweet stuff it is so good (mint choc-chip ice cream...mmmmm!) These look delicious. I am thinking of something good that I can give to my sister this weekend! Thanks for this I don't have to think too much. Anne ! this looks amazing. 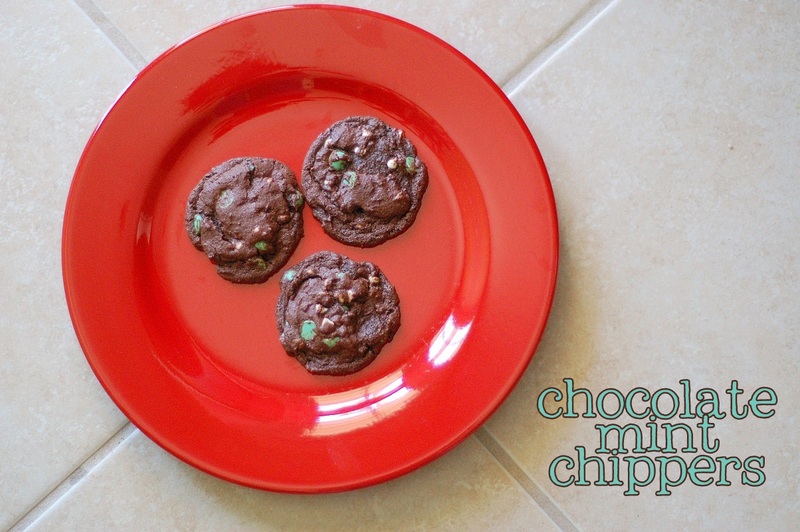 Chocolate can only get better when there's mint involved! The look delicious!